Dr. Adeera Levin is setting ambitious targets for Can-SOLVE CKD. A groundbreaking Canada-wide research program into chronic kidney disease, with over $40 million in funding, is taking a novel yet straightforward approach: rather than starting with answers, they’re starting with questions. The project is funded through the Canadian Institutes of Health Research and a variety of donations, including one for $500,000 from St. Paul’s Foundation. Rather than starting with, say, a promising new drug molecule, the Canadians Seeking Solutions and Innovations to Overcome Chronic Kidney Disease (Can-SOLVE CKD) network will look at what’s important to patients, how and when they currently get treatment, then work alongside them to make those treatments better. The five-year initiative encompasses numerous research areas: early screening, patient education, novel drug treatments and the usefulness of stem cell therapies. 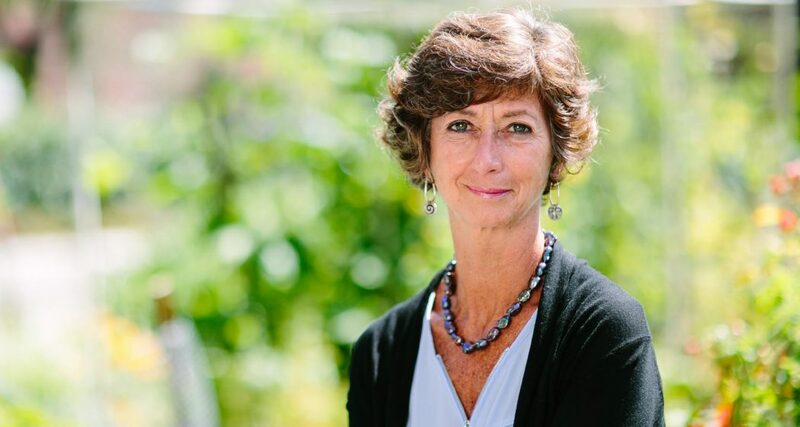 A British Columbia team headed by Levin will co-lead the project, collaborating with physicians, researchers and patients from across the country. “In Canada and internationally, kidney disease research has been fragmented and not as integrated on patient-focused questions as some other specialties,” Levin says. The initiative aims to change that, by creating a way to gain knowledge and share best practices throughout Canada. More than three million Canadians incur significant damage to their kidneys, which can be caused by a number of different problems: high blood pressure, diabetes, infections, or inherited or acquired systemic diseases. Any damage to the kidneys’ ability to filter waste out of the body causes system-wide health issues or worsens other conditions, and can lead to early death. Chronic kidney disease (CKD), the umbrella term for all conditions which cause kidney damage, costs the Canadian health care system over $50 billion each year. According to the Kidney Foundation of Canada, more than 90 per cent of Canadians with CKD don’t know they have it. Current care models primarily focus on the disease’s most serious late stages: dialysis or transplants for those whose kidneys have shut down entirely. St Paul’s and the province of BC have been pioneers in treating the disease early to keep it from progressing, through the development of structured multidisciplinary patient-focused clinics. Though kidney damage affects more Canadians than heart disease (1.4 million) or diabetes (3.4 million), nephrology has fewer clinical trials than any other medical field. Levin aims to change that. The Can-SOLVE CKD project poses a wide range of questions, relevant to all stages of the disease. They’re trying to find new methods to catch kidney problems early, even when additional, co-occuring conditions like diabetes make that all the more complicated; they’re trying stem-cell therapies; they’re testing established drugs that have shown promise to help kidney patients as well. This fits in with the project’s overall ethos, and the philosophy that’s guided Levin’s entire career: examine everything that could work, then winnow it down to what works best. While Can-SOLVE CKD aims to break new ground in the worldwide field of kidney care, Canada’s unique geography and population shape its goals. For people living hundreds of kilometres from the nearest hospital, the current care model that expects them to frequently visit a clinic just doesn’t make sense. The project aims to help patients in rural and remote areas by trying out new techniques like self-monitoring and telehealth videoconferencing. To better deliver treatment for Indigenous peoples, who stand at a higher statistical risk of kidney disease, the research team is consulting with a team of Indigenous people to find culturally appropriate studies and therapies that address their needs. Working with the initiative’s Indigenous Peoples’ Engagement and Research Council, Levin discovered many Indigenous people were reluctant to join in randomized controlled trials because they felt it was unfair for a control group to be denied a potentially life-saving new drug or therapeutic strategy. Using this knowledge, the project team is changing study designs to respect these views, while still ensuring that there is good ‘science’ and conclusions. They’re also making sure that there is Indigenous representation in all aspects of the kidney study design and data. Levin first tested the multidisciplinary, patient-first approach that informs Can-SOLVE CKD at St. Paul’s, with a 1991 study that later grew into the hospital’s Kidney Care Clinic (KCC). The clinic began with the idea that a one- stop shop for kidney patients, where they could meet with doctors, dietitians, social workers and nurses all in one appointment, might improve health outcomes and quality of life. It did. Established as a permanent clinic in 1999, the KCC now cares for more than 1,200 patients. 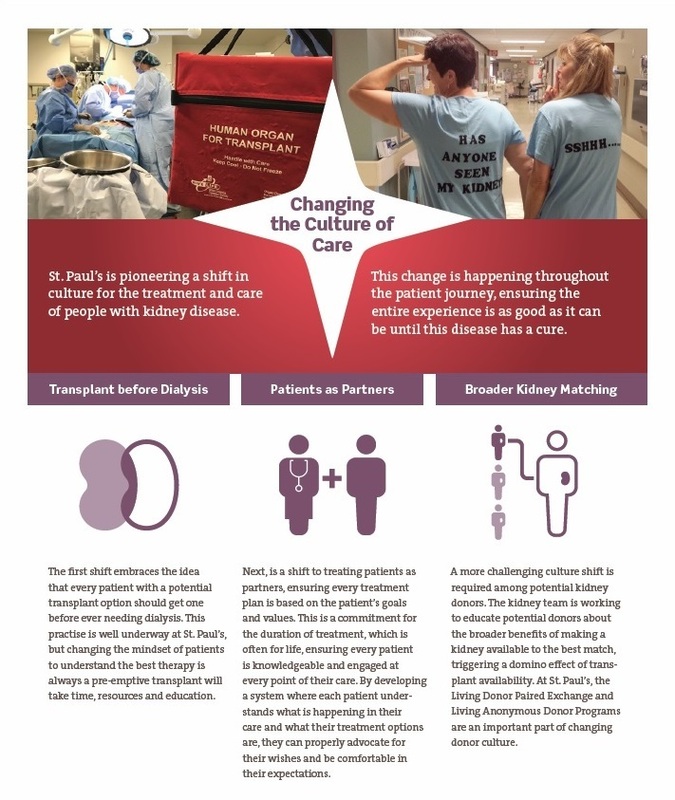 By giving targeted care to people with varying stages of kidney disease, the clinic has been able to slow progression for many and reduce the need for replacement therapies like dialysis or transplants. The goal of Can-SOLVE CKD is to take that kind of thinking and, by applying it to studies across Canada, reap the same kind of results. The targets are ambitious. By 2020, Levin and the team hope every Canadian with, or at risk for CKD will be screened and able to access the best possible treatment. By screening and treating early, the team hopes to significantly reduce the number of patients who experience kidney failure. They also hope to double the number of people involved in clinical nephrology trials. While the initiative will collect an unprecedented amount of data about all aspects of CKD, Levin expects some important insights to come from a place beyond hard facts and figures. Dr. Adeera Levin began her medical career at St. Paul’s in 1990, starting with a kidney disease project encompassing both research and clinical care. Since then, she’s become a world-renowned leader in her field. She currently serves as the president of the International Society of Nephrology, and was appointed to the Order of Canada in 2015. Aside from her work heading up Can-SOLVE CKD and as a consulting nephrologist at St. Paul’s, Levin is a scientist at the Centre for Health Evaluation and Outcome Sciences (CHÉOS). She has also been the driving force behind the BC Renal Agency since it was formed in 1997. The agency – the only one of its kind anywhere in Canada – allocates funding and resources for kidney care across the province for all patients. The agency also works to ensure a continuity of care if patients move within BC. “It’s very patient focused, very transparent, and we try to deliver evidence-informed care,” Levin adds. The model of patient-first care has been proven to improve outcomes.